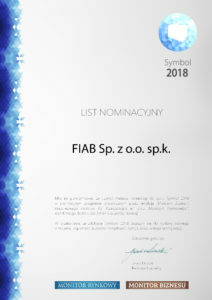 We are praising another nomination for the title Symbol 2018 in the Innovation category. Rynkowy”, an independent supplement distributed with „Dziennik Gazeta Prawna” and „Monitor Biznesu”, an independent supplement distributed with „Rzeczpospolita„. The program is a professional tool for companies and institutions that value shaping the right media image and the highest quality policy. The symbols are an expression of appreciation of the activities and achievements that have been achieved so far. Those companies whose actions should be noticed and appreciated are honored; These companies can be a model for the entire industry.